BMW’s latest ‘F90’ M5 is already a supersaloon par excellence, even with its shift to four-wheel drive coinciding with a continuation of its turbocharged engine to make this an M5 unlike any other preceding model. But how would BMW go about turning what is already a near-perfect 600hp four-door into something even more special as the M5 Competition model? The key lies in the suspension. As fast as they’ve always been – indeed, the old E60 M5, launched as far back as 2005, was claimed to go beyond the magic 320km/h, where legal (i.e., on a very long and very deserted Autobahn) – M5s are supposed to blend some executive car luxury characteristics with brutal performance and excellent handling. And the current F90 is a master at this: as much fun as it is in corners, when you want it to relax and ride smoothly, then the big Beemer is happy to accommodate. That therefore leaves a little more firmness available in the Competition version’s remit. 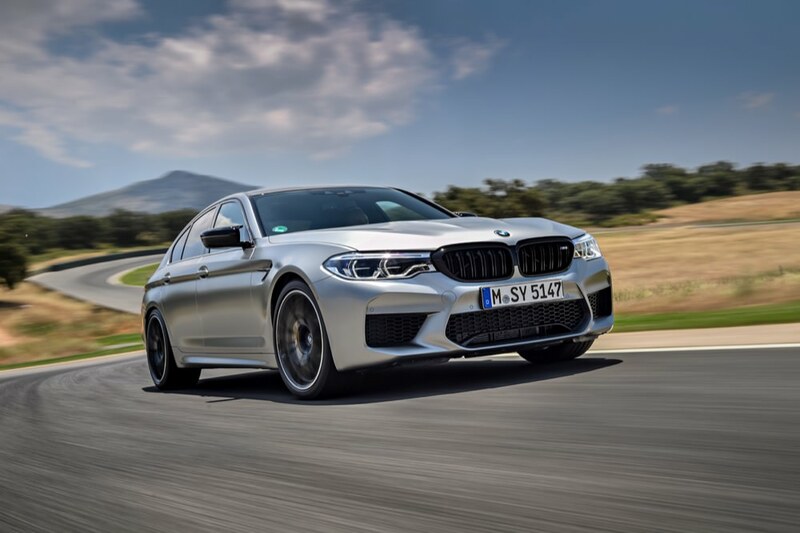 Unlike its smaller M2 cousin, where the Competition model replaces the old non-Competition variant, both the 600hp M5 and this harder, 625hp M5 Competition, will be sold alongside each other. So the Competition’s way of trying to tempt you to splash out extra cash on its charms is to convince you that it’s the better-handling machine, at the expense of some ride comfort. To that end, BMW’s gone to town on the underpinnings. The engine mounts are 55 per cent stiffer on the Competition than they are on the standard M5, at 900N/mm versus 580N/mm. This means the 4.4-litre V8 transmits its power and torque to the all-wheel-drivetrain in a more timely and efficient manner, making the car seem even more urgent (its 0-100km/h time is a tenth quicker, for instance, at 3.3 seconds, which cannot be explained by a mere 25hp uplift on a massive 600hp). Then the camber of the front axle is increased, to improve the sharpness of the M5 Competition’s turn-in. At the back, the anti-roll bar is 10 per cent stiffer than the 600hp M5’s equivalent item, while the toe links of the suspension are now fitted with ball joints instead of rubber bushes, once again improving rigidity and supposedly aiding handling. The ride height of the Competition is 7mm lower than the regular M5’s, while the M Variable Damper Control software has been recalibrated to take in all of the details above – plus the fact that the M5 Competition rides on lighter, forged 20-inch alloys wheels wrapped in Pirelli P Zero rubber. ← What makes the Mercedes-AMG C 63 great?